I bought this in a fit of middle/high school French class nostalgia, as these were a favorite in class for a comical way to read something in French that wasn't from a text book. 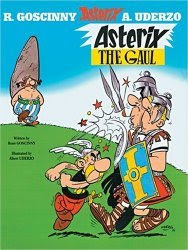 A fairly light and quick read, you get a good introduction to Asterix and his friends, mainly his best friend Obelix and the Druid, Getafix, who brews the magical potion that gives the Gauls their super-strength, which they use to keep the invading Romans at bay, thereby keeping their village the only remaining free village in Gaul. There is quite a bit of humor mixed into the story, especially with the characters names (such as Vitalstatistix, the village leader; Cacofonix, the village bard; and Centurion Crismus Bonus). In this first volume, after Asterix singlehandedly defeats four Roman guards, Crismus Bonus sends a spy into the Gaul village to find out their secret. The Romans then kidnap Getafix to force him to make the magic potion that gives the Gauls their super-strength. Asterix goes to the rescue and then allows himself to be captured so that he and Getafix can have some fun at the Romans' expense. After some calamity with a super-strength potion that has some adverse effects, Asterix and Getafix are released through the help of an unlikely ally. Asterix the Gaul is a fun introduction to the Asterix characters and world. The art is fluid, colors are bright and the story is clever and humorous. Worth reading if you want a light, fun read.